It’s been about ten years since famous pop sensation Alvin and the Chipmunks released their last album, “The A-Files,” to the world. Since then the chipmunks have been on an extended hiatus, though I sure many people weren’t really too concerned with whatever happened to those squeaky chipmunks that used to entertain kids. People have had so many other things to listen to. Though with good children’s music difficult to find, a comeback for the original quartet may be a welcome change of pace, starting with the new movie “Alvin and the Chipmunks.” The bad news is the movie may not be nearly as good as you’d hope it would be. The good news is it also isn’t nearly as bad as I thought it would be. The story for the film isn’t really worth mentioning, as it’s one of those scripts that Hollywood keeps a stock pile of nearby, to do little more then change the names and certain situations to make workable. Case in point: Dave Seville (Jason Lee) plays a songwriter who is on the rocks. His latest song was rejected, his girlfriend broke up with him, and he lost his advertising job. Then a trio of talking, singing chipmunks stow away in his basket of muffins, and when Dave meets the rodents it’s hate at first sight. 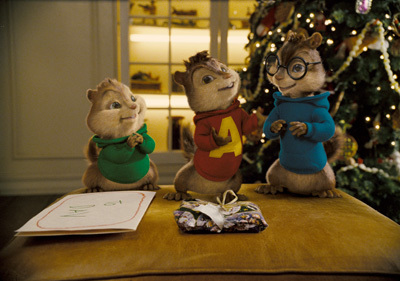 The chipmunks do manage to inspire the writing of “Christmas Don’t Be Late,” and so Dave strikes a deal with the chipmunks they can’t refuse: Sing my songs, and you have a new home. As you might imagine, chaos follows. 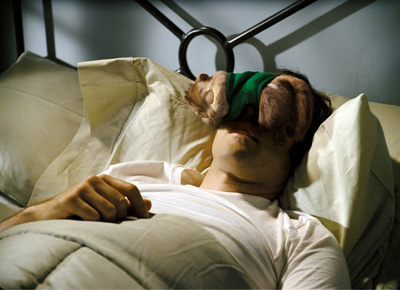 That said, though the famous scene where Alvin eats a chipmunk turd in the trailer is in the movie (though by Simon instead of the lead), and a couple of fart jokes do make it into the final product, the movie isn’t nearly as crude as you’d expect it to be. Most of the chaos in the film was actually present in the early cartoons that inspired the film, so the movie adaptation is fairly accurate. 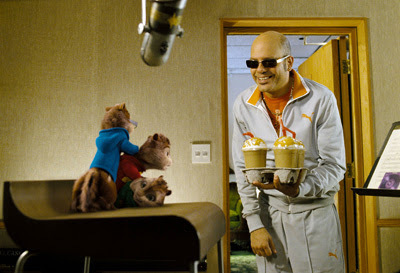 Less so though with the design of the chipmunks, who look more like Chip and Dale then the original creations. 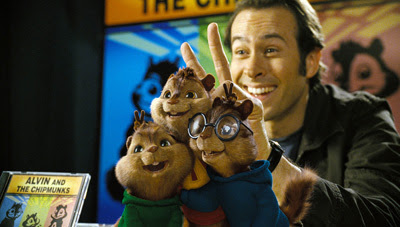 Of course, if I’m to get technical, I guess the cartoons diverted from the original design of the chipmunks, which were more realistic, so maybe the movie has it right. Anyway, the movie at one point involves, as you might expect, a greedy manager who plays off the chipmunks rise to fame in an attempt to capitalize on them. Thus the movie has a message about being true to yourself, loving your family, and showing a little bit of humility. Nothing special, but hey, it’s a kid movie. 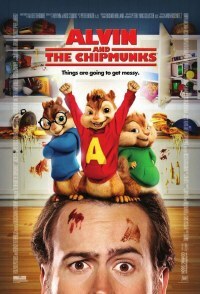 The voices of the chipmunks are Justin Long, Matthew Gary Gubler, and Disney Channel heartthrob Jesse McCartney. I can understand wanting to go for big name talent in a movie, but this is pointless celebrity involvement, as the process used to make the actors sound like the chipmunks distort the voices so that they don’t sound anything like the actors playing them. They also sound, predictably, the same as one another. Re-hiring Ross Bagdasarian Jr. would have made more sense, as well as saved a couple million dollars. But hey, what do I know, I’m just a film critic right? At the end of the movie the credits list off close to every Alvin and the Chipmunks CD released. I was surprised myself at how many of those albums there really are. I can’t really recommend the movie, but it’s not terribly offensive in any way. The story is predictable and cute, the songs are mostly classic rocks songs with the occasional new age song, and if the movie helps revive more chipmunk albums, then I’m all for it. Yeah, their voices are annoying, but I’d rather my kids listen to squeaky versions of classic songs then to Britney Spears or 50 Cent. That said though, while the movie may bring the records back into the spotlight, today’s plugged in audience will most likely discover them over iTunes rather then in a record store. Parents have little to worry about with this film. There is no noticeable language, the violence is all slapstick, however there is some milk crude humor as well as a couple of sexual innuendos. Recommended for ages 8 and up.